21 Layers of the Soul is out now! Author and Healing Medium Annemiek Douw presents her new book and explains how the 21 Layers of the Soul are related to the aura and to your everyday life. As a Soul we make a plan to ensure that we experience all the things we want to during our time on Earth. We choose our team of helpers, guides and advisors and together we map out the main route. We also make appointments, or ‘Soul Agreements’, with other Souls who will play an important role in our lives. These agreements are contracts between two Souls (or a group of Souls), in which each agrees to play their part in the play that we call life; all parties involved put some effort in and everyone benefits from it, though the benefits (that is, the learning they do on a Soul level) may completely differ for everyone involved. For instance when you embark on your life journey, you’ve already decided to meet certain friends along the way. When that will happen and the exact circumstances, you will forget the minute you ‘land’ on Planet Earth, but as soon as you meet the people that will prove to become lifelong friends, you’ll usually recognise each other instantly. It just feels familiar. You feel at ease and it doesn’t take a lot of energy to pick up where you left off on a Soul level. They will share a part of their lives with you, and vice versa, and since every human being is wired precisely for the ‘job’ they come to do, they will add to your life exactly what you need. Or they may not add what you need because that too, can be in your Life Plan. Anyway, normally they bring to the table exactly what you need. And you return the favour. Of course the great love you share your life with, is a Soul with whom you have an important Soul Agreement. Life partners are very important for your journey. How your life unfolds and how happy you feel during your trip, is a result of finding and recognising the right partner – and being recognised in return. For it’s not always easy to share and to open yourself up to someone who gets you on a level that you can’t control. Your Soul partner is wired in a way that you aren’t, together you can reach new heights but it may also be scary since everything changes when the two of you meet. When in a relationship with someone with whom you don’t have an underlying Soul Agreement, it’s easier to go about it rationally and not fully commit – sometimes it even feels safer. However, with a Soul Partner your buttons are pushed, without you even knowing that there were buttons that could be pushed. But that’s exactly why you made the agreement. To help each other grow and to love unconditionally. You have so much to share together, so much to give to one another and you can fulfil your Life Plan and achieve all your life goals in the best way possible – if you have the courage to connect and go to that next level together. Of course your parents, siblings and children are also Souls with whom you agreed to go on this journey. 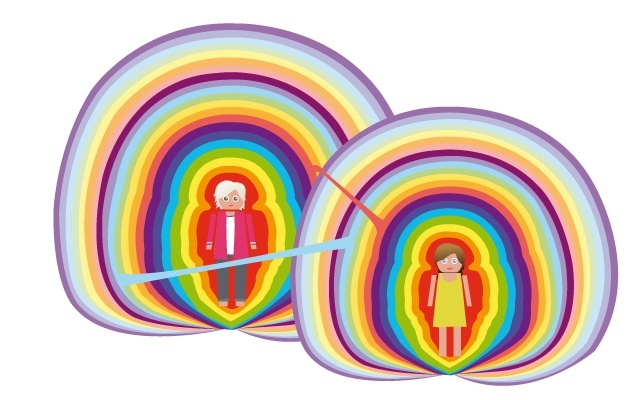 When you decide who your parents will be, you not only take into consideration what their individual Souls have in store for you, you also look at the family dynamics in the generations that came before them so you can choose the right combination of family themes as well as the right set of parents. Family themes are issues that can run in a family for decades, even centuries, and make it easier for you as a Soul to encounter them, if you’d set your mind to doing that when you designed your Life Plan. That’s why, on a Soul level you can choose to incarnate into a family with themes of sexual abuse, violence, addictions or neglect. We all know the expression: “With friends like these, who need enemies!” For no one can hurt you so deeply as someone you fully trust. So sometimes friends do do hurtful things to us and when they suddenly seem to turn into enemies, they quite often stick to the original plan! Knowing this can perhaps make you look differently at the relationships that were broken off in your life. 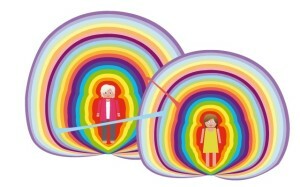 But you also meet people, in your working environment or private life, who you just really can’t get along with. Again, buttons are pushed and you are forced to deal with it. This process, if you embrace it, will help you heal from within and find your inner peace, but from an earthly point of view it might be very irritating and seem like a waste of energy, even though it is exactly what your Soul asked for. Over the last 15 years that I have been working with the aura, I have discovered that these Soul Connections can be found in at least 21 specific layers of the aura. For every problem I find in a clients aura, the layer in which I find it shows precisely the purpose of their experiences thus providing them with insight and understanding that helps in their healing process. In fact, it often results in cured diseases, newly found inner peace and harmony in relationships or life in general. While reading the layers and working in them with my clients, I learned how to heal them if there were problems and then I translated everything I found into an easy to read book, with a description of each layer and 101 real life case studies. I was so impressed with the impact of the themes in the layers, and so happy with the results of healing people in a whole new way, that I really wanted to share that with the world. Everything is energy, so I thought if I could capture all this information, and all of these experiences, in one book other people could benefit from it as well just by holding it, reading it and attuning to it. That’s why I wrote 21 Layers of the Soul, healing the karmic ties with friends, family, lovers and enemies about my unprecedented work, first in Dutch (2011) and now finally, after a lot of work, I am happy to present this book in English as well. Soul Connections aren’t the only subject described in 21 Layers of the Soul. It’s also about my personal journey and shows how I, coming from an unlikely background in engineering, came to be a medium and turned my life around. It tells about working with guides, talking with deceased loved ones and how angels support us every step of the way. It also describes how we work together during healing sessions. Past lives are often the reason that people get stuck in this life, so I describe a lot of them too, but I also report on conversations with people who seemingly died ‘before their time’, leaving their loved ones with a lot of questions and unbearable pain. To me 21 Layers of the Soul is about connecting to yourself and to other Souls and growing on a Soul level, so in short: it’s about life. Life seen from a different perspective and healing yourself along the way. Of course, I would be thrilled to have you here in my practice in Holland or meet you somewhere when I tour around the world, or even give you a healing over Skype* so you can experience working in these layers for yourself but in reality, that isn’t always possible, or even necessary. If you just pick up the book and resonate with it or with some of the layers or cases, you’ll find that that energy will already do something comforting. It will help you deal with your own issues, and you will find that without even fully understanding, it will help you heal in the higher layers and will help you change your life. That’s what I wish for, and what I hope it will bring to you. Enjoy the read! Are you interested in experiencing your Soul or would you like to read more about all the themes and connections in the 21 layers of your aura? My new book 21 Layers of the Soul: Healing the Karmic Ties with Friends, Lovers, Family and Enemies contains 101 real life cases. 21 Layers of the Soul is out now! 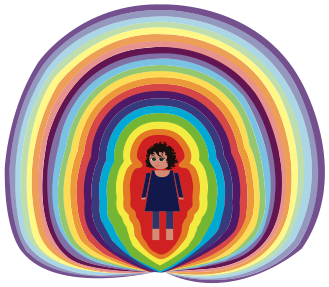 You can order it now and receive a free, downloadable poster of the 21 Layers of the Soul. Alternatively, the Dutch version and the English version for Dutch readers are available here. Skype sessions are also available! 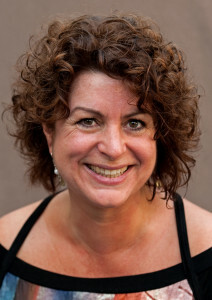 ANNEMIEK DOUW, MSc is a management coach, energetic therapist, lightworker, medium, trainer and author. Coming from an unlikely background in engineering, Annemiek has always been interested in how people think and grow at a physical, mental, emotional and spiritual level. In her work within the government and business sectors, she began to see how illness comes into people’s lives, often making it unpredictable and seemingly out of control. This influenced her to start exploring bioenergetics and other alternative therapies, eventually leading her to complete a 3-year course at the Natural Medicine Academy South-Netherlands to become a paranormal therapist. In 1998 she dedicated herself to this work full-time. She later fell ill herself for an extended period of time, which allowed her to gain first-hand insight into the human experience of illness, and to learn how the soul is an internal compass that continuously guides. Probing more deeply into how this compass works, Annemiek discovered 21 layers of the soul that influence our ability to grow and to heal in our bodies, minds and relationships. This discovery became the foundation of her unique healing style, and today Annemiek helps clients heal at many levels, and teaches them how to read this compass for themselves. 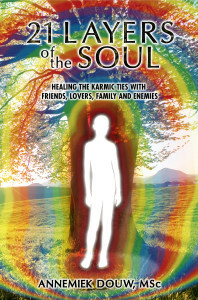 Wanting to share this unprecedented work with a wider audience, she published the Dutch language book De ziel in het licht van haar hogere auralagen in 2011, which now available in English under the title 21 Layers of the Soul: Healing the Karmic Ties with Friends, Lovers, Family and Enemies. One Response to 21 Layers of the Soul is out now!